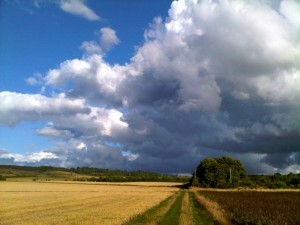 Suitably dramatic skyscape over Windmill Field, close to the BeaconLit venue in Ivinghoe, Bucks. BeaconLit, our local literary festival, was launched in 2013. This year (July 1) is the fifth festival. It is now held in the dry and welcome warmth of the local school in Ivinghoe, Buckinghamshire. This is a blog I wrote after the first event in 2013. Beaconlit is a literature festival held for the first time (June, 2013) in Ivinghoe, an ancient Buckinghamshire village on the edge of the Chilterns. Many of those who attended the inaugural event on a very wet midsummer Saturday would, no doubt, be happy just to see it repeated next year, and then survive and prosper. Realists would hope for nothing more, in these tough days of austerity and restraint. There was a small but very appreciative audience for the inaugural BeaconLit, but the organizers hope to build on this. Then there are the visionaries, the optimists who dare hope for even more. There was, after all, nothing pre-ordained about the international celebrity status now bestowed on Glastonbury, Hay on Wye and Charlton Park, Malmesbury. Those three places were no more obvious locations for, respectively, a pop music, books and ideas, and world music festival (WOMAD), than any other similarly-sized place in scenic rural England, and Wales. Than, say, Ivinghoe and the scatter of villages around it arranged under Ivinghoe Beacon and known collectively as the Beacon Villages (of BeaconLit). Festival fame arrives randomly, and accidentally in smaller places, although Ivinghoe is hardly remote., about 45 minutes from London by the fastest train and a short drive from the station. It’s easier, of course, to launch cultural events that become annual fixtures in the calendar in cities and bigger towns, where businesses and powerful politicians lend their support. Smaller towns and villages must work harder, and usually depend on the inspiration, ambition and drive of an individual, or small group or committed people. This was the case with BeaconLit. There was also welcome support from the Arts Council England, Bucks County Council, and Aylesbury Vale District Council and Vale of Aylesbury Housing Trust Community Chest initiative. Without that same sort of vision, and determination to see it endure, Hay would still be just one among hundreds of gorgeous small tourist towns on a river. It’s the same for Glastonbury. That strange and startling hill, semi-sacred in some people’s eyes, has its own pulling power, but you’d find similar camping fields with a tendency to turn to quagmire all over England. And any number of stately homes know that, given the break, they could have hosted a music festival like WOMAD, World of Music, Arts and Dance. BeaconLit is lucky enough to have a ready made venue, a marquee with room for over 400 people arranged in comfort for a formal ball that takes place there every year on the Friday nearest to Midsummer, and an evening of stand up comedy the following evening. So there was plenty of space for the panel, exhibits tables, a corner for story telling on a magic carpet, and a cake stand. Attendance for the inaugural event was respectable, with a small but very appreciative audience, brought in through advertising, promotion in the community library across the road (a prime mover in the festival), fliers in surrounding towns and a busy social media publicity campaign in the preceeding week. The organizers hope to build on this. Because of of the short availability of the marquee, the event was limited to an afternoon, with two panels. The authors speaking at Murder and Mayhem – the dark world of crime and thrillers, were S J Bolton, Alison Bruce and Elena Forbes. This was followed by Pain and Passion – the tearful truth about romantic fiction – with Kate Lace, Carole Matthews and Sue Moorcroft. There were stalls where the writers sold and signed their books, and talked to people. A writing mini-workshop, guided by facilitator Claire Steele, was billed as a possible first step in a flourishing writing career. Another stall offered an introduction to the services of the local community library. The mediator Dave Sivers, who was responsible for attracting the impressive haul of writers, chaired the two panels with aplomb, with skillful distribution of questions to the writers. There was an accomplished running commentary on Twitter from one of the commitee. Was it only the idealists in the audience who made a favourable comparison to Hay, where authors talk for 40 minutes or so, then field questions – and where prices are never less than £5, rising to £20 or more for famous writers such as John le Carré? Hay, it should be noted, receives additional sponsorship from the Daily Telegraph, Sky and individual sponsors. The panellists could easily have been transported to the Hay Festival, along with the moderator, and wouldn’t have been out of place. The difference is that the audience would have paid more, and wouldn’t have had the same access to the speakers. At Beaconlit it was good to see writers engage with audience members, some of whom might have been would-be writers. One writer commented, too, that it was more interesting to attend an event not dedicated to a single genre. Will there be another Beaconlit? There were positive comments published on social media by the attending public and the writers themselves. One of the guest authors described it as the most enjoyable event she had attended outside her own book launches. Cost was clearly an issue. Some local people told the organizers they thought a £7.50 entrance fee too much to pay. Others, and that included an encouraging number from outside the villages, felt the cost quite acceptable, to be in the presence of six top authors discussing their craft and answering questions. The next one would be promoted more widely, based on what was learned this time. There is room in most villages’ calendars for such an event, as a variation on the village staples – the church fete and scouts’ jamboree. Writers live in the country, and welcome the break from their lonely garret – or is that just poets? Ivinghoe, for those who want a beak from over culturally-provisioned London is not so far. Now that might just appeal to the metropolitan supporters of Hay, who face a major journey deep into the country for their annual fix. They have the added bonus of a very distinguished restaurant next door, a 300 year old pub, a newly opened cafe, one of the best surviving windmills in England, a canal walk, a nature reserve and the wide open Chilterns only a mile away.